standard by American Nuclear Society, 01/01/1988. 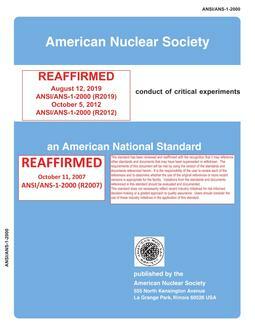 standard by American Nuclear Society, . standard by American Nuclear Society, 03/23/2000. standard by American Nuclear Society, 01/08/1979. standard by American Nuclear Society, 04/14/2003. standard by American Nuclear Society, 12/19/2017. standard by American Nuclear Society, 01/01/1978. standard by American Nuclear Society, 07/25/1978. standard by American Nuclear Society, 01/01/1979. standard by American Nuclear Society, 02/27/2013.